Today, we’re going to turn roses into lip balm! 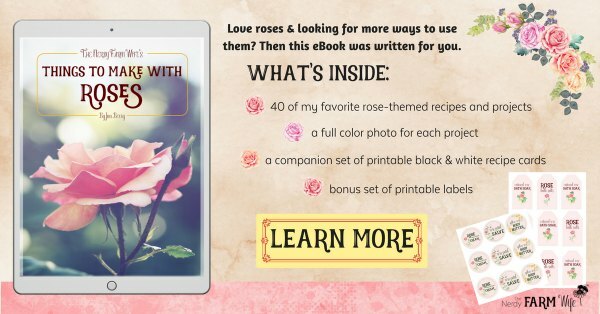 This is a recipe from my newest eBook, Things To Make With Roses. To make this, first you’ll need some rose petals. You can either go outside and gather these off of the roses growing around your home, or you can order dried, organic petals online from a place such as Mountain Rose Herbs. If using fresh roses, spread them out in a single layer on a paper towel or brown paper bag and let them air dry for a few days. We’re doing this to reduce any potential water content that could make our oil spoil faster. Once they’re dried, we’re going to make a rose infused oil from them exactly like the one we made for Rose Petal Salve a few weeks ago. 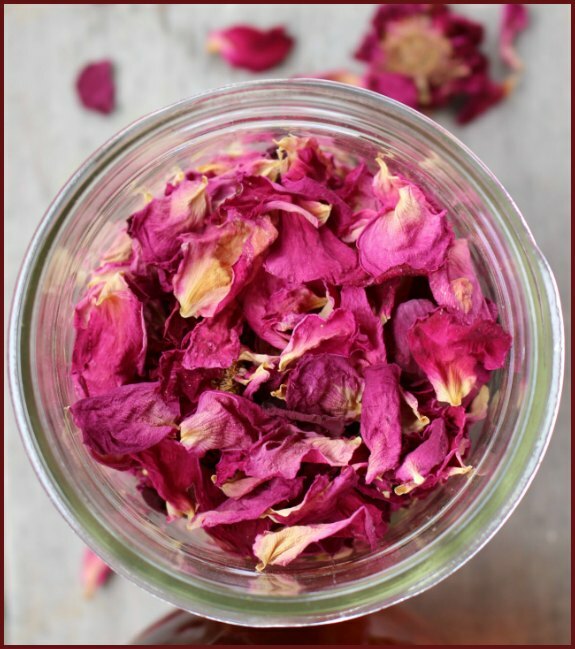 Fill a jar with dried rose petals until it is half to three-quarters way full. The size of the jar will depend on how many flowers you have. For a small amount, use a small jar; if you have plenty of petals, use a larger jar. Precision isn’t that important at this step; you’re basically filling some type of container about half to three-quarters full with dried rose petals and then covering them with oil. Which type of oil is up to you. I like to use Olive Oil or Sunflower Oil for lip balm, but other oils such as Avocado Oil, Sweet Almond Oil or Apricot Kernel Oil will work nicely as well. For the slow way, cover the top of your jar of oil with a couple layers of cheesecloth and secure it with a rubber band. Place the oil in a cabinet and let it sit for 3 to 4 weeks. For the fast way, set the jar gently into a pan with a few inches of warm water and heat slowly over medium lowish heat. Keep the burner on and let the oil stay in the heated water for one to two hours then remove. Once you’ve completed one of those methods, you can go ahead and strain your oil to use in your lip balm or you can let it infuse several days longer in a dark cabinet. Another option is to strain and then repeat the infusion steps with a new batch of rose petals but the same oil you just finished infusing. This is called a double infusion. The shelf life of your strained oil is about a year. Store in a cool, dark place for best results. Pour a tiny amount of the required rose infused oil into a small bowl or cup and mix a bit of alkanet powder at a time into it, to form a thick, dark red paste and set aside. This will be used for adding natural color to our lip balm. Place the remaining oils, wax and butter in a heat proof jar or measuring cup. Set this down into a pan filled with a few inches of water and bring the water to just under a simmer. Heat until the wax and shea butter is melted. Add peppermint essential oil then pour into tubes, tins or lip balm sliders. This ratio of oils and beeswax makes a good consistency for lip balm tubes. If using tins, try adding up to another tablespoon of oil to make it easier to use. For a vegan version of lip balm, use about half as much candelilla wax as the amount of beeswax called for. So, in this recipe, you’d use about 1/2 tablespoon candelilla wax instead of 1 tablespoon beeswax. Castor oil is an important ingredient that gives your lip balm a nice gloss and smooth finish. Try to keep this in your recipe, if possible. You can substitute another butter, such as mango or cocoa, instead of the shea butter. If you don’t have or want to use peppermint essential oil, you can omit or use other flavors such as spearmint or (sweet) orange. If you don’t want to use roses, you can substitute another edible flower or herb instead such as: violet leaves, lemon balm, mint leaves, calendula and so forth. For more ideas as to how to customize your lip balm recipes, check out my post: How to Create Custom Lip Balms. If pregnant, alkanet root may be contraindicated for you. Check with a qualified healthcare provider for their professional advice. 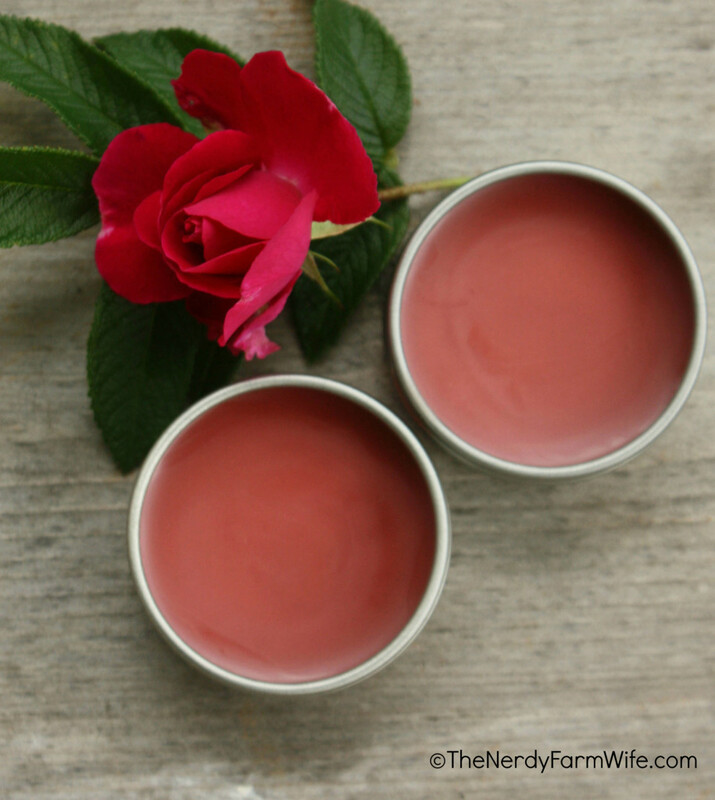 If you enjoyed this peppermint rose lip balm recipe, let’s keep in touch! 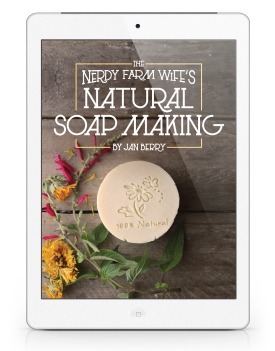 Sign Up to receive emails, two to three times per month, filled with my best flower & herb projects, DIY body care recipes, natural soapmaking tutorials, plus news about my latest projects! Tagged lip balm, rose, rose peppermint. Bookmark the permalink. Looks like a fun project! About how many tins of lip balm do you end up with? Hi Sarah! This batch filled up 5 of the half ounce tins with lip balm, with a wee bit left over. Does it matter it matter what color of rose petals you use? 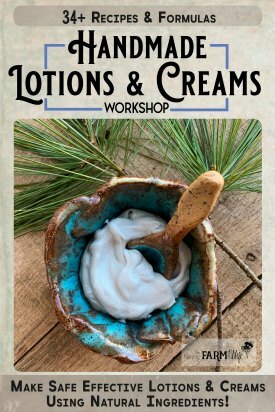 Will that effect the color of the salve at all? Or is it only the alkanet root that adds color? How much alkanet root did you use to get the colour in the picture. Also, is there a reason you add the colour to the rose oil to make a paste instead of gradually adding it to the mix after the oil is added? Hi Aly! I used a tiny pinch that was too small to weigh or measure – just the teeniest pinch between my fingers. The reason I used a paste is so I could adjust the color to be just how I’d like it to be, but you could always add the alkanet directly to the oil too. I’ve also use pre-infused alkanet oil for a portion of the plain oil to add color. You have lots of options! If the color ends up too light, you can always melt it again and add more color until it reaches a shade you’re aiming for. Thank you for sharing your knowledge so freely and generously! Does the rose infused oil smell like roses or are you just trying to get some beneficial properties from the rose petals? I love the smell of roses. Where do you get the containers? They are so beautiful! I checked out your shop. I love your site, and I am wondering how could I purchase items at your shop. Anyways, I love all the recipes to DIY herbs. They are so creative, and useful! I plan to make a peppermint rose lip balm for my sister, as a homemade gift. I hope your sister enjoys the lip balm! When I buy other natural lip balms they have vitamin E in to preserve them. Does the peppermint rose lip balm not need that? Hi Jessica, I’m glad you like the recipe! :) Vitamin E is a great addition that will help extend the shelf life of your lip balm. I don’t include it in my recipes because I have two family members who are super sensitive to Vitamin E unless it’s a special soy & wheat free kind. I had a certain palm based one that went over well, but they reformulated it and it now has soy. So, until I find one they can tolerate, I just keep everything I make free of it. However, if you don’t have an allergy to vitamin E then adding a few drops would be an excellent idea! Since our roses don’t normally bloom during the winter! And I would want to be able to make the lip balm thru out the winter, what is the best way to do it? Just dry alot of rose petals so you can infuse them? Or should you infuse them and just have the oil. I hope that it makes sense. Thank you!! Hi Jessica! Either way would work. If you go ahead and infuse the oil now, it will be more convenient to make your lip balm later, but you also start the countdown to how long the oil will stay fresh. If you dry the rose petals, you can make the oil later so that it’s fresher, but you also just can’t pick up and make something spur of the moment. 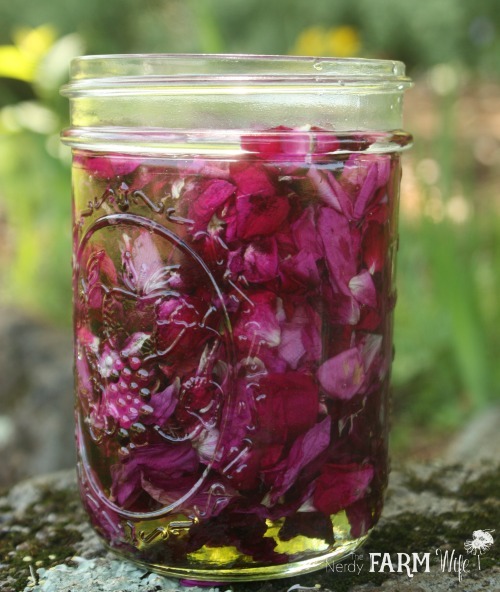 What I do, is keep a smallish size jar of rose infused oil on hand, but a large jar of just dried petals – because they’re good for many other projects as well. Me again!! I want to try it using mint leaves… Will the mint leaves make it green or is there something natural that you can use to make it green? Or would you just leave it the color that it naturally is? Thanks!! You can use mint infused oil, but it won’t impart a green color. Hi Jessica, That can also happen if your shea butter has gone through temperature fluctuations. (In storage or shipping.) If that has consistently happened with the same batch of shea butter you might want to try a fresh supply or a different supplier. As far as overheating, you’re right! That can be a cause too. One thing you could do is to melt your beeswax and oils first, then stir in your shea butter after the beeswax melts. That way it only spends a short amount of time in heat. Could you explain why you don’t use dried rose petals? It’s winter now, but even if I made this in the summer, is there a benefit to fresh over dried. I almost always used dried herbs in infusions but I’d like my best chance at getting the rose smell to come through so if that’s fresh, I would do that. Also, just I’m asking, I saw that you have some lemon balm recipes (I haven’t looked yet) but I would wonder the same thing, do you prefer to use them fresh? Thanks! It seems that freshly dried (but still dry) petals have the best chance of retaining a rose scent versus using ones that have been stored for months, so I usually make up a big batch of oil at their peak blooming time to use in projects like these. You can still use dried rose petals in this though, no problem. The same goes for lemon balm. You can use dried any time of the year, but I like to dry a few days then infuse the oil right away. Can you use mica powders in lip balm recipes? I know their is no vitamin e oil in this recipe, but in a lot of lip balm recipes their is. What is a good replacement for it? What kind of shelf life does the lip balm have? Hi Kelly! Lip balm usually has a shelf life of 9 months to a year, but it depends on how fresh the ingredients are when you make it. (Old oils will go rancid sooner.) You can also add some vitamin E or rosemary antioxidants to extend the shelf life of oil based products. Hi there. I wanted to ask, is the color of the balm visible on your lips? Hi Cara! It depends on your natural lip color, but even so it’s a barely-there tint. HI, I was wondering if it would work to use rose oil to scent, or infuse the lip balm oil. Where I live roses don’t grow naturally in abundance, and I guess I could use dried store bought petals, but wouldn’t rose oil work just as well? I made this the other day. Apparently, my alkanet root powder was too much or not enough as it is a purplish color. And, there is a waxy layer on top. It reminds me of when they used to put wax on top of jelly, except this is a really thin layer. What happened? Hi Joy! That certainly is a strange reaction. Where did you buy your alkanet powder from? I wonder if it might have an additive or something that shouldn’t be in it? Alkanet root does turn purplish in a really alkaline mixture, such as soap, but you should get shades of pink to ruby red when using it in lip balm. One other idea, did you use standard beeswax or was it bleached? I was wondering if you make these rose type things with any roses? I have a small Monrovia rose bush. Hi Sarah! For medicinal purposes, the more aromatic a rose is, the better it tends to work – but for these cosmetic recipes, you can use any type that you have growing. Are most Jars heat proof, my measuring cup isn’t, just wondering? Hi Eva! All canning jars are heatproof, since they’re designed to withstand the high heat of a pressure cooker. If you’re reusing one (like a mayonnaise jar), they might be a little more fragile though. I like to stick with tested canning jars, to be on the safe side. Because I am learning about this I have a few more questions. First, I’m not sure how to melt the bees-wax as to measure it, and I don’t have a scale to weigh it. Also, I don’t know if I have disturbed the infusion process because I was smelling the oil every so often, and changed the petals after two weeks, not three to four, and am wondering if this will change the oil in any way. Any input would be appreciated .. I am new at this and am seeking reassurance, Perhaps I should have waited three weeks before starting the double infusion process, but the petals seemed like they were not releasing any more oils..
Hi Eva! You can grate the beeswax with a cheese grater and then pack it tightly into the spoon to measure it. (Spritz your grater with baking spray or rub it with oil first, or it will be terribly hard to clean off!) You could also melt big pieces of beeswax in an old tin can that has been set down into a larger pot with a few inches of water (to make a double boiler) and then pour it into your spoon, but you’ll get a little bit more than you need that way and it might melt your spoon if it’s plastic! Hi, I was just wondering if maybe I could use rosewater in this recipe and just maybe add a little more beeswax to make up for the extra liquid. Hi Audrey! Rosewater is lovely and I wish that it could be incorporated, but unfortunately lip balms are completely oil based, and you can’t add anything water-based or it will just separate and ooze right out. The tint I used for this is great, unfortunately I have more of it in stock now then I could ever use. Any ideas for how to make the most of it and use it up? Hi! If the tint doesn’t show up strongly on your skin, you could use it as a general nighttime salve for dry spots (feet, knees, elbows). Another option: you could melt it back to a liquid, adding more alkanet root this go-round and turn it into a cheek tint. It will need more frequent applications, but generally works as a light tint. (Add enough alkanet root powder so it looks extremely dark in the tin, in order for it to show up.) A final idea: many food banks also take personal care products and usually appreciate donations! I have a question! Would unscented organic liquid coconut oil work too? I just ask because I didn’t see you list it. Hi Katie, I was wondering if you can actually use essentials oils for lip balms. I love the idea and the recipe but could you possibly use rose essential oil rather than making the rose-infused oil? Thanks! I’m making this for stocking stuffers and don’t want to spend any more than necessary. Hi Sofia! I think you could use rose essential oil, since it’s lip-safe, but you’d only want to use a tiny drop as too much could overpower the lip balm. Really want to make some Peppermint Rose Lip Balm for Christmas gifts and I didn’t plan ahead well. I don’t have alkanes root powder on hand, but I have beet powder for making grain-free Red Velvet Cake. I’m on the second infusion of the rose oil, I used a lighter olive oil and all I can smell is olives! Do you think this will be reduced with the second infusion? Or maybe just more time? I used the quick infusion in the crock pot. Hi Rebekah! The scent of the infused oil will be very subtle, even with the most fragrant roses since it’s difficult to capture the scent. The main purpose of the infusion is to capture the skin benefits of the roses, instead of fragrance. This looks interesting. I have had good luck with several of your recipes. I do not have alkanet powder but have hibiscus powder, Could it be used instead? Hi Jenny, I’m happy to hear you’ve had some good luck with the recipes! The color in hibiscus powder is water-soluble, so unfortunately it doesn’t show up in oil-based lip balm.